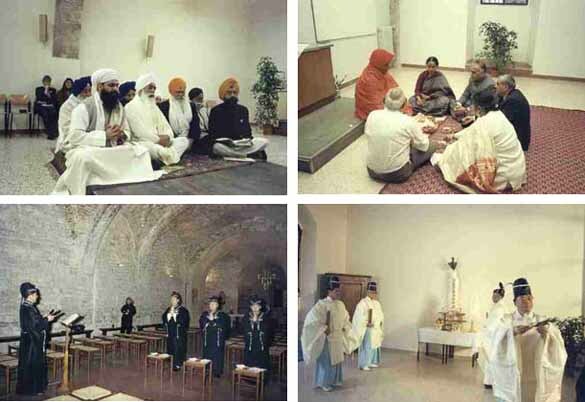 January 2002 - At the invitation of John Paul II, different pagan sects worshipped their false gods in various chapels of the Basilica of Assisi and the Franciscan Monastery. Above left, Buddhists; right, Animists. Below, first row, Sikhists and Hinduists. Below, second row, Tenrikyian and Shinto rituals. It is difficult to imagine a more radical profanation of sacred places. In the Old Covenant when a pagan idol was worshipped in the Temple, the Holy Ghost qualified this as the abomination of desolation introduced in the sacred place (Dan 9:27).